Though it took over a decade and $1 billion to build, the Getty Center has solidified itself as one of Los Angeles’ most significant cultural institutions. Maybe the most important. Some 1.6 million tourists visit annually to take in the sweeping views, the impressive art collection, and the sprawling Robert Irwin-designed garden. Interest in The Getty, and its namesake, is as heightened as ever. Last year saw the release of Ridley Scott’s All the Money in the World, a crime-thriller based on the 1995 book Painfully Rich: The Outrageous Fortunes and Misfortunes of the Heirs of J. Paul Getty. Then there’s the new FX television show Trust, also inspired by events surrounding the kidnapping of John Paul Getty III. 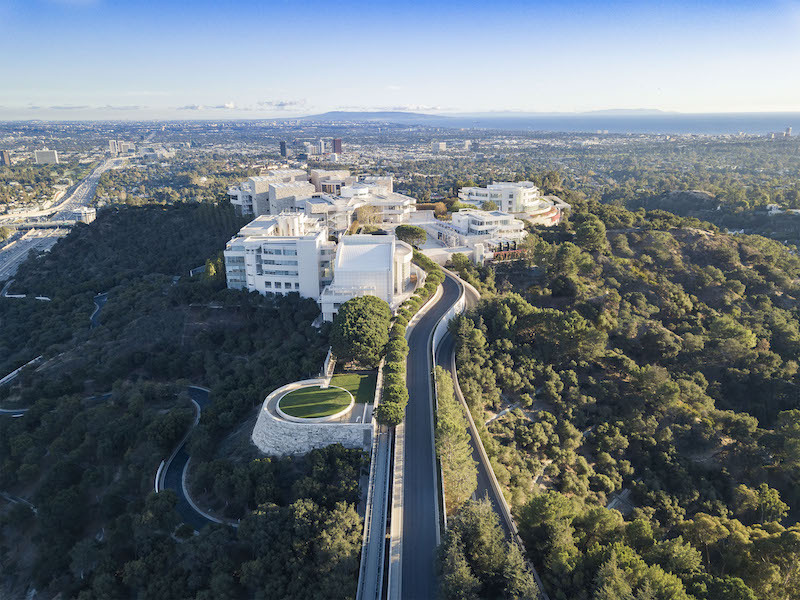 Moreover, the six-building art campus of The Getty Center is currently celebrating its 20th birthday, marked by a series of events that concludes on May 20. 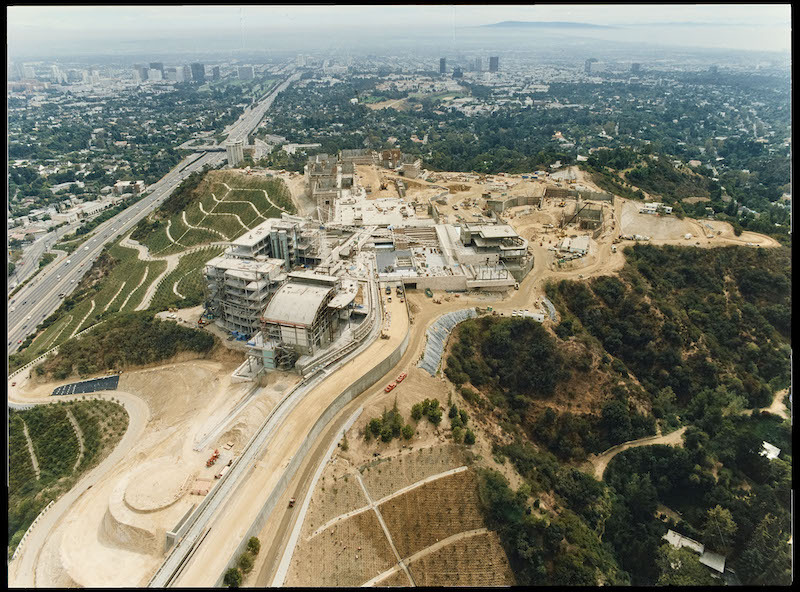 All in all, now seems like the perfect time to look back at how The Getty Center came to be, what distinguishes it as a cultural landmark, and why it remains as relevant now as when it was first built. The Getty Museum is so named for Jean Paul Getty, founder of the Getty Oil Company. Getty amassed a fortune so huge that, at one point in time, he was declared the wealthiest man in the world. Though notoriously frugal, he spent liberally on the arts, predominantly in collecting them. Upon his death in 1976, he left most of his fortune—$700 million, to be specific—to the Getty Museum in Malibu. At this point, the Getty Museum only had that single location, now known as the Getty Villa. Getty had begun planning the Villa in 1968 to house his collection, modeling it after Italy’s Villa dei Papiri. Though the Villa was completed in 1974, Getty was living in England at the time and never made it to see his Malibu mansion prior to his death in 1976. There were also various facilities scattered around West L.A., according to Ron Hartwig, Vice President of Communications at the J. Paul Getty Trust. There was the Conservation Institute in Marina del Rey, the Research Institute in Santa Monica, and the Getty headquarters in Century City. 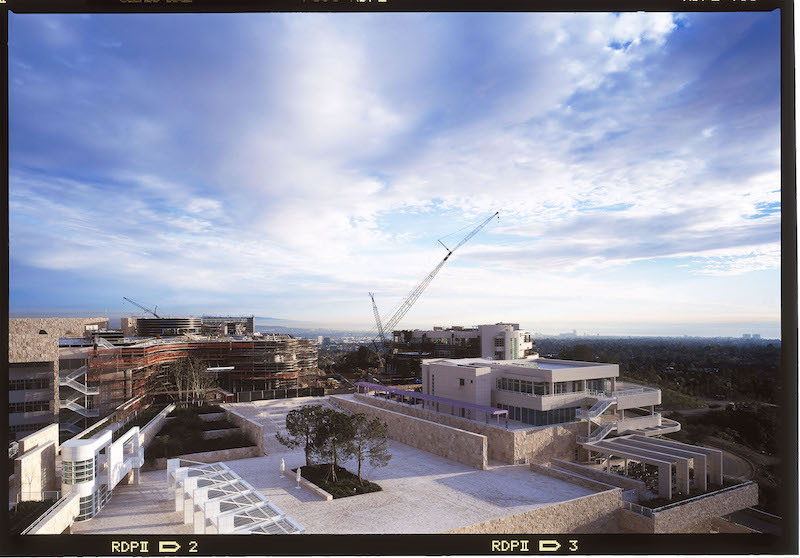 After various legal issues surrounding the estate were rectified in 1982, the trustees decided that it made sense to build something new where the Getty programs could co-exist on a single campus. Additionally, it was determined that Getty’s antiquities would remain in the Villa, but the rest of his collection—manuscripts, drawings, photographs, paintings, and decorative arts—would move to what was to become the Getty Center. “It was an opportunity to build a larger museum to house those collections, and provide for the acquisition of other works of art over the course of time,” Hartwig said. A competition was held to determine who would build the Getty Center and Richard Meier was ultimately selected for what some called “the commission of the century.” Meier is a modernist architect who, at the time, was known for all-white, geometric designs akin to what he’d done with the High Museum of Art in Georgia and New Harmony’s Atheneum in Indiana. In Meier’s pitch, he emphasized the collaboration among the Getty’s various facilities. “I think he was able to articulate that and then show it as a design, and that’s what captured the imagination of the trustees,” Hartwig said. The site had already been selected: a 24-acre campus located in the Santa Monica Mountains, 900 feet above sea level. Other locations had been considered, but Hartwig speculates that founding president Harold Williams realized the potential of that bucolic hilltop spot. “Nothing like this has ever been built before,” Williams told the New York Times in 1983. The choice of location called for an extensive amount of planning and numerous meetings with the site’s neighbors. It was the neighbors who objected to Meier’s penchant for stark white buildings, reaching instead a compromise in which the building would be covered in a combination of aluminum panels and travertine. Enough travertine, the NY Times quipped at the time, to “clad a chain of Campidoglios.” Another agreement stated that every piece of construction equipment would be contained on the Getty site, as opposed to moving through the surrounding neighborhood. It was also crucial that the building be incredibly secure, not just for guests, but the priceless artifacts it would contain. “As Meier and the other engineers and planners came to the site, they realized that building a major museum that would house collections worth billions would have to be built in a very, very safe way to protect the collections in the event of a fire or earthquake,” Hartwig said. For instance, construction was already underway when the Northridge Quake happened in 1994, allowing engineers to observe the site and make changes based on structural safety. In fact, the Getty Center might be one of the safest places in L.A. in a dire situation. There is a 1 million-gallon water tank beneath the Center and rations to feed several people for several days, should access to the Center be cut off. During the recent wildfires, Hartwig said the Getty was able to accommodate 200 firefighters who showered, ate meals, and slept at the Getty in between the grueling challenges of battling the blaze. From early on, one of the Getty’s most magical design elements was found in the tram meant to whisk visitors from the street level parking all the way up to the hill. Hartwig said early criticisms of the tram insinuated it was elitist to pull visitors so far away from the city, though time seems to have debunked that idea. Public transit users and drivers alike can easily reach the ground level before embarking on the same ride to the top. Some cultural hubs with less foresight are harder to access for visitors without cars or guests with mobility issues. Not to mention, the short ride offers a lovely view as the city disappears below. Of course, the The New York Times poked fun at this too, marveling at how odd it was to be riding on anything resembling public transit in late ’90s L.A.
“I think [the tram] was Meier’s idea of transporting people from the real world that existed as you parked your car, and then clearing your mind and preparing you for what they you’d experience when you got to the top of the Getty Center—both in terms of viewing the collections and just being above and looking out over the city,” Hartwig said. All of these considerations, not to mention the earthquake hangup, resulted in the Getty Center taking longer than expected to design and build. Though it broke ground in 1989, five years after Meier was commissioned, it was not officially complete until 1997. Daytime at the Getty Center. Photo by Brian Champlin / We Like L.A. It also, in Hartwig’s opinion, caused a shift in how other cities saw Los Angeles. Even those ever-critical New York folks seemed to agree, in their way. 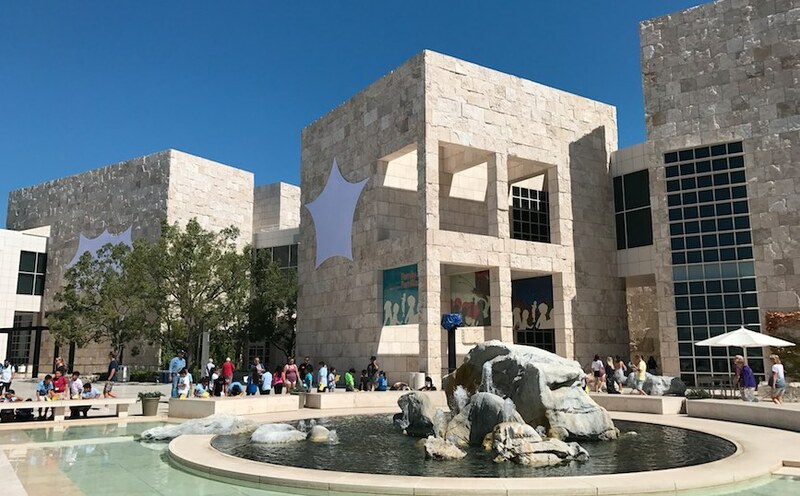 “The Getty Center should make Angelenos in general feel a little better, in part by making L.A. seem more like a real city,” an article in The New Yorker read. The Jewish Weekly noted Los Angeles hadn’t received so much positive press since it hosted the 1984 Olympic Games. For anyone who still huffs about Southern California’s supposed lack of culture, Hartwig points to exhibit Pacific Standard Time: LA/LA, which saw over 84 exhibitions of Latin American and Latino art at over 70 institutions, sprawling from San Diego to Santa Barbara and Palm Springs. PST:LA/LA is also a good example of what happens at The Getty Center that visitors don’t see. According to the terms of the Getty Trust, they are required to spend a portion of their massive endowment each year. Thus, the Getty Foundation provides funding for various art endeavors, such as the $16 million it awarded to support PST. The Foundation also paid for the training of conservationists to preserve 15th and 16th-century oil paintings on wooden panels. Much of that physical work is done underground at the Getty Conservation Institute, where experts develop methods to protect and preserve materials, including mosaics. Additionally, the Getty Research Institute has since 1980 invited historians and researchers to do their work in its library, which contains over 2 million volumes, archival holdings, and digital connections to art libraries across the world. There is even an apartment where researchers may live for up to a year. The Getty Center and its namesake have not been without controversy. All the Money in the World depicted Getty’s reluctance to pay off his grandson John Paul Getty III’s kidnappers, who demanded $17 million for the teen’s safe return. Getty argued that paying the ransom would put his other grandchildren at risk. The frustrated kidnappers sliced off the younger Getty’s ear and mailed it to a media outlet. Kevin Spacey had played the part of Getty in the film until allegations of sexual misconduct came out against the actor, at which point he was replaced by Christopher Plummer. 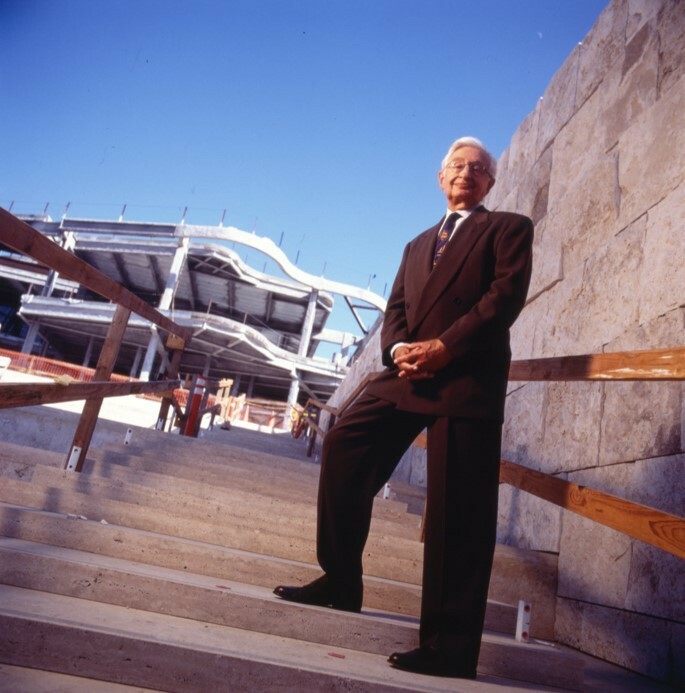 Similar allegations have surfaced surrounding Getty architect Richard Meier. A recent New York Times article detailed the accounts of multiple women who claim the architect harassed or assaulted them. Meier has since taken a six-month leave from his firm. In this way, perhaps The Getty Center is not unlike other L.A. landmarks with a storied past. Lest we forget that Griffith J. Griffith (of Griffith Park fame) was jailed for shooting his wife and William Mulholland, celebrated as the father of L.A.’s water system, built the faulty St. Francis Dam that broke and killed over 450 people. Complications from the past aside, The Getty Center remains of undeniable cultural importance to Los Angeles. Whatever you think of Getty the man, his final act of generosity has left an indelible mark on the city of angels, now and for generations to come. If you haven’t been to the Getty Center in a while (or at all), perhaps pay a visit and wish it a happy birthday. Admission to The Getty Center is free. Parking will cost you $15 per car or $10 after 3 p.m. For public transit riders Metro routes 734 and 234 will both get you where you need to go.